When you're out riding your motorcycle, it's important to ensure your ability to see and be seen. If your headlights aren't getting the job done or your mirrors leave too many blind spots, you should consider upgrading your motorcycle. Find the right parts that make you comfortable when you're out riding. The better you feel, the safer you'll ride. However, it's unfortunate that no matter how safe you are, we know that accidents still happen. Motorcycle crashes can be especially devastating, changing your life forever with unexpected medical costs and work time. If you've been seriously injured in a motorcycle accident, we're here to help. Call us at 1-866-943-3427 or simply fill out our free online legal consultation in the top right corner of the page. We'll review your case for free, answer your legal questions, and determine if you have a case. Call us today! 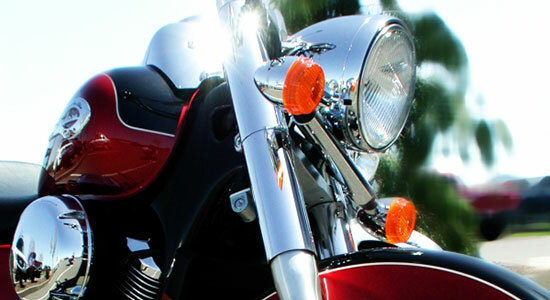 A reliable headlight is essential for any safe motorcycle. If you need to replace your headlight, there are many different types from which to choose. Most motorcycles have regular halogen lights, but HID and LED lamps are offering more benefits and being more common. High Intensity Discharge (HID) – 3 times brighter than standard halogen lights, HIDs last 10 times longer, shine brightly enough to keep the road illuminated, and are impossible to miss. Light Emitting Diode (LED) – With a 50,000 hour lifespan, these burn bright and last especially long. LED lights make you more visible, and you can use them for all the bulbs on your bike. Both LEDs and HIDs are exceptionally efficient, bright, and can illuminate far beyond regular halogen bulbs. They may cost you slightly more up front, but pay for themselves over time. They can make things easier to see, as well as keeping you highly visible to other drivers. Most bikers don't realize how much they use their mirrors during any given ride. Whether you're merging on the highway, changing lanes, or monitoring traffic behind you, your mirrors should be clear. Over time, mirrors can bend and become damaged. If you notice any loss of visibility in your mirrors, it's important to replace them. Try the array of different shapes and styles, and you may find that your road visibility will drastically improve. New mirrors can help you spot dangers before they enter your blind spots and keep you safer while riding. Custom Mirrors – While they may look great, custom mirrors might not improve your field of vision beyond the stock mirrors. Flat Glass – This mirror type will give you're a realistic idea of the distance of objects behind you, but may not be as large as other mirrors. Convex Glass – With a larger field of vision, you'll be able to see more behind you. However, the shape of the glass will make objects appear farther away than they are. Helmet Mirrors – These additional mirrors attach directly to your helmet. They can be a great option for extra visibility. There are many options for mirrors, so it's important to find the one that's right for you. When you're most comfortable, you'll ride better and feel safer. Injured in a Motorcycle Accident? Call Us Today! We've successfully recovered money for our injured motorcycle clients, helping them find the financial stability to put their lives back together. Just visit our Verdicts and Settlements page for an example of the money we've recovered for our clients. Our experienced legal professionals are standing by to help if you've been injured in a motorcycle accident. We'll review your case for free, answer all your legal questions, and fight to get you the compensation you deserve. We're available at 1-866-943-3427 or simply fill out our free online legal consultation located in the top right corner of this page. Remember, there's never a fee unless we get money for you.